Below the Maxpedition Keyper I connect a quick-release fob. 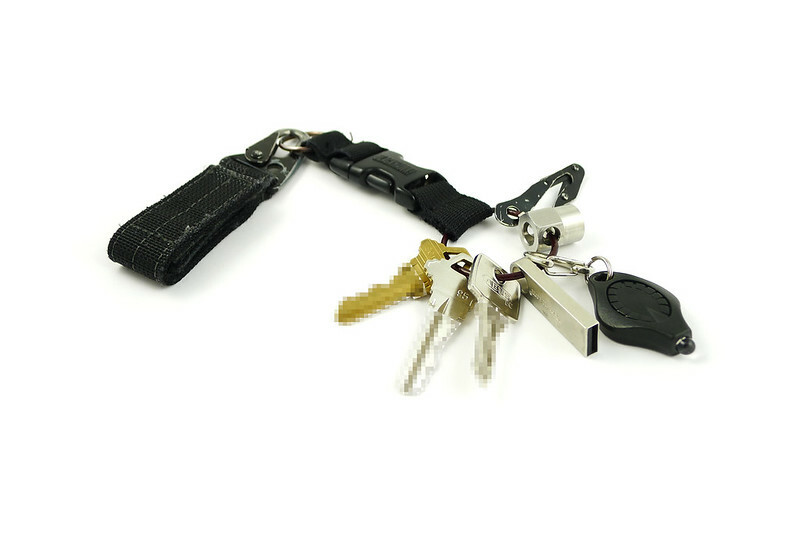 This adds enough length to the setup that the keys can be silenced in my pocket, but still securely attached to my belt via the Keyper. The side-release buckle provides easy, one-handed access. The fob attaches to the Keyper via a normal split ring. For most of the 8 years that I’ve used the fob, I’ve attached the keys to it via another split ring. I tried a cable ring from CountyComm for some time, but it was too large and the closure unscrewed itself frequently. Later, when the FREEKey came out, I gave it a shot. It worked well enough but I found that it offered no practical advantage over a normal split ring. Finally, last March I learned about the Flex O Loc Key Ring from Brian Green. I bought a pack of them and have been using one on my keychain ever since. I find that they’re perfect: the right size, easy to open, and secure when closed. On the keychain itself I carry three keys: an apartment key, a work key and a bike lock key. Next to the keys is a Kingston DataTraveler SE9 (16GB). I find that the DataTravelers are a good combination of performance, durability and price. I consider this my “dirty” stick: it holds no personal information and is formatted with FAT32. I’ll stick it in pretty much anything. It used to hold Liberté Linux, but unfortunately that project seems largely abandoned now. Next to the USB stick is a Photon Freedom Micro LED light with a green beam. I’ve lost count of how many years I’ve had this. It doesn’t produce a significant beam, but it frequently comes in handy. I like to know that I always have a light source attached to me. Next on the ring is the pit for my Pitlocks. This is a specially keyed nut that is needed to remove the Pitlock skewers on my bike. It increases the difficulty of stealing a wheel. The final item is a SERE V Cutter. I consider this more of a toy than a tool. It does cut cord very well, but so does a knife. I wouldn’t buy it again, but as long as I have it I figure I might as well use it, and it is small and light enough that I can put it on my keychain and forget that it’s there. This post was published on 2013-08-01 . It was modified on 2013-08-01 . It was tagged with edc, review, gear.